Jesus’ memorable parable was the inspiration for Tolstoy’s story “Where Love is, God is” is beautifully adapted in the Claymation film called Martin the Cobbler.”The reading of this text in church is also crucial to the plot of the delightful Ellen Burstyn film Walking Across Egypt." "The Being of the Son of Man when the Son of Man is not the Son of Man," D Mark Davis, Left Behind and Loving It, 2017. Ministry Matters, November 23, 2014. Preaching Helps (Reign of Christ). Rev. Dawn Chesser, United Methodist Church General Board of Discipleship, 2014. Evangelectionary for November 23, 2014, Jonathan Shively, Evangelism Connections, 2014. Points for Preaching and Teaching, The Lectionary Lab, 2014. The Reign of Christ, Bruce Epperly, The Adventurous Lectionary, 2014. "Reign of Christ," Kathryn Matthews Huey, Sermon Seeds, SAMUEL, UCC, 2014. The Lectionary Lab, The Reign of Christ, the Rev'ds Dr. John Fairless and Delmer Chilton (aka "Two Bubbas and a Bible"), 2011. Jesus Now, The Reign of Christ - Judgment Day, lectionary, study and worship resources from Faith Futures Jesus Then & Now. Rumors, for November 23, 2008, Ralph Milton, "Sermon helps for preachers with a sense of humor." "Glory and the Desperate Stranger," Nancy Rockwell, The Bite in the Apple, 2017. Living by the Word, Audrey West The Christian Century, 2017. "It's Not Up To Us," TJ Tetzlaff, Modern Metanoia, 2017. "Justice and Love - The Reign of Christ," Sermon-Stories.com, 2017. "The Politics of a Love beyond Dualism," Fritz Wendt, Political Theology Today, 2017. "Members of the Family - the Final Word," Glenn Monson, Law & Gospel Everywhere, 2017. "Seeing the Face of Jesus," Janet H. Hunt, Dancing with the Word, 2017. "The Very Thing I Was Eager to Do," Dan Clendenin, Journey with Jesus, 2017. "The Persistence of Sheepery," Lynn Miller, Art & Faith Matters, celebrating our creative and living God by generating art and architecture resources for congregations and individuals. Art and Faith Matters facebook page contains additional resources. "Past, Future, and Present," Michael Ruffin, Connections, 2017. "The Unexpected God," David Lose, ...In The Meantime, 2014. "Throne Mentality," Karoline Lewis, Dear Working Preacher, 2014. "Jesus, Poor People and the Underside of Thanksgiving," Billy Honor, ON Scripture, Odyssey Networks, 2014. Video: Midnight Run. "Bleating Hearts," commentary and conversation, RevGalBlogPals, 2014. "Your Letter of Reference to the Last Judgment," Dan Clendenin, Journey with Jesus, 2014. 2011. 2008. "The Face of Christ," Janet H. Hunt, Dancing with the Word, 2014. "Goat Cheese and Starfish," Bob Stuhlmann, Stories from a Priestly Life, 2014. Lectionary Notes for Reign of Christ Sunday, Beth Quick, 2014. "Here Comes the Judge!" Bob Cornwall, Ponderings on a Faith Journey, 2014. "The Least of These," Suzanne Guthrie, At the Edge of the Enclosure, 2014. "Joyful Noises," Beth Scibienski, 2014. Sermon illustrations for Christ the King based on Ezekiel 34:11-16, 20-24 — Ephesians 1:15-23 — Matthew 25:31-46 by Derl Keefer, Bob Ove, Mark Ellingsen, Ron Love from SermonSuite. "Gate Wide Open!" Thomas Beam, 2014. "Learning to Live Like Sheep," Brian Volck, Ekklesia Project, 2014. "King of the World," Lynn Miller, Art & Faith Matters, celebrating our creative and living God by generating art and architecture resources for congregations and individuals. Art and Faith Matters facebook page contains additional resources. "So That You May Know The Hope,," Jan Richardson, The Painted Prayerbook, 2014. Use of images. "Team Goat, Team Sheep, and the Strange King of Everything," Sharron R. Blezard, Stewardship of Life, 2014. 2011. 2008. "Is That You?" Andrew King, A Poetic Kind of Place, 2014. "Failed Kings and the Good Shepherd," Walter Brueggemann, ON Scripture, 2011. "Sheep and Goats and Judgment, Oh My" David Lose, Dear Working Preacher, 2011. "Four Spiritual Practices for Preaching on Matthew 25," Carl Gregg, Patheos, 2011. "The Feast of Christ the Comrade" Peter Woods, I Am Listening, 2011. "#Poetry; Get Your Celesital Self Down Here!" Tim Good, The Naked Alien, 2011. "Judging Sheep and Goats," Alyce M. McKenzie, Patheos, 2011. "Preaching 'Reign of Christ' Sunday as a Progressive Christian," Carl Gregg, Patheos, 2011. Sermon Notes for November 20, Michael Rich, In-Formatio, 2011. "Ultimate Reality: Goats, Sheep, and Judge Jesus," Sharron R. Blezard, Stewardship of Life, ELCA, 2011. The Painted Prayerbook, "You Who Bless," Jan Richardson, 2011. Use of images. Joyful Noises, Melissa Bane Sevier, Contemplative Viewfinder, 2011. "Gotta Serve Someone," Neil Chappell, a weird thing, 2011. "What Kind of King?" Peter Lockhart, Reflections on Faith & Spirituality, 2011. "The Politics of Matthew 25:31-46," Timothy F. Simpson, Political Theology, 2011. "No Baaad News..." Linda Fabian Pepe, Theological Stew, 2011. "The Great Reign of God's Justice," Kathi Martin, Randall C. Bailey, Michael Carden, Human Rights Campaign, Out in Scripture, 2008. Dylan's Lectionary Blog, Christ the King Sunday, 2005. Biblical Scholar Sarah Dylan Breuer looks at readings for the coming Sunday in the lectionary of the Episcopal Church. "I'd Have Baked a Cake," by Jim Somerville. A Sermon for Every Sunday. Video sermons from America’s best preachers for every Sunday of the Liturgical Year. "God Has Left the Building," the Rev. Sue Haupert-Johnson, Day 1, 2014. Christ the King A, Sarah Johnson, Sermons that Work, Episcopal Digital Network, 2014. Reinado de Cristo/Cristo ReyA, El Rvdo. Antonio Brito, Sermones que Iluminan, 2014. "The Sheep from the Goats," Frederick Buechner Sermon Illustrations. "If Christ Is King, What Does That Mean?" Greg Garrett, Day 1, 2011. Christ the King Sermons, Edward F. Markquart, Sermons from Seattle. "Heaven's Audit of One's Soul," the Rev. Dr. Wiley Stephens, Day 1, 2008. "The Good Shepherd," Faith Element, 2014. Bible Study, Christ the King A, 2014, Donna Stanford, Sermons that Work, Episcopal Digital Network. Estudio de la Biblia. Fiesta de Cristo Rey, por Donna StanfordSermones que Iluminan, Episcopal Digital Network, 2014. 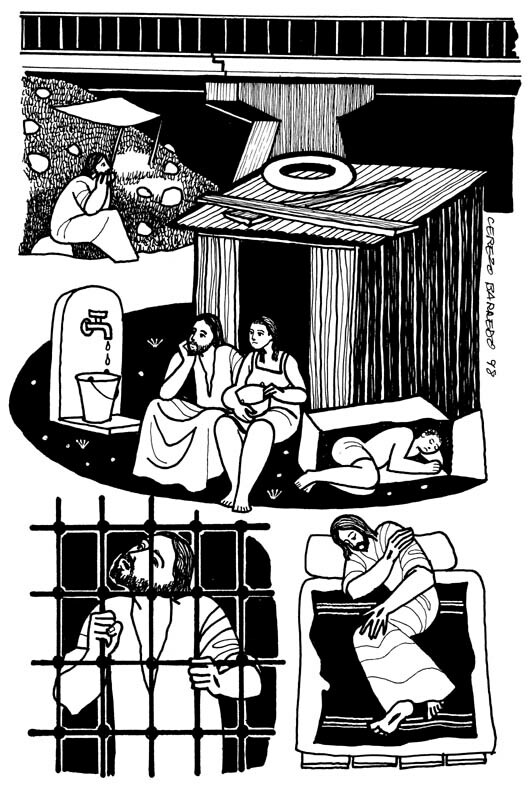 "Portraits of Prison Ministry," study guide for adults, Robert B. Kruschwitz, (other resources at) "Prison," Christian Reflection, The Center for Christian Ethics at Baylor University, 2012. (Matthew 25:31-46) Focus article: "Reading for Life," Alesha D. Seroczynski, "Project TURN," Sarah Jobe, "The Hospitality House," Mary Alice Wise. "Untamed Hospitality," Elizabeth Newman, (other resources at) "Hospitality," Christian Reflection, The Center for Christian Ethics at Baylor University, 2007. Life in Liturgy, Christ the King, 2017. Worship Planning Helps (Reign of Christ): Worship & Preaching Notes, Hymn Suggestions and Worship Resources from the United Methodist Church General Board of Discipleship. Mustard Seeds, "How Shall We Live," Christ the King, 2017. A lectionary-based ideas resource for leaders of contemporary worship, Ann Scull, Gippsland, Australia. Worship resources for Christ the King based on Matthew 25:31-46 by H. Burnham Kirkland from SermonSuite. Lectionary Liturgies, Reign of Christ, Thom M. Shuman, Presbyterian Church (U.S.A.), 2014. Liturgy for the Celebration of Life, Reign of Christ A. Liturgies from a Progressive/Post-Liberal Theology, Revd Rex A.E. Hunt, The Uniting Church of St James Curtin, ACT, 2011. 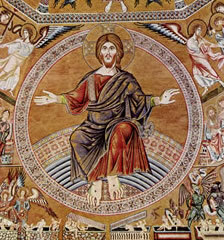 A Liturgy for Christ the King, Rev. Thomas L. Weitzel, Evangelical Lutheran Church in America. Worship and Liturgy Resources, Christ the King, by Rev David Beswick, Uniting Church in Australia. Lector's Notes, Christ the King, Gregory Warnusz, Saint Jerome Parish, Bellefontaine Neighbors, MO. Notes and commentary for those reading this week's lectionary texts to the congregation. 21st Century Worship Resources, Reign of Christ, UMCDiscipleship.org. Offertory Prayers, Reign of Christ, UMCDiscipleship.org. The Timeless Psalms: Psalm 100, (Reign of Christ A), Joan Stott, prayers and meditations based on lectionary Psalms, 2011. Prayers of the People, Christ the King A, Fr. Jeremiah Williamson, Praying the Scriptures, 2011. The Timeless Psalms: Psalm 100, Joan Stott, prayers and meditations based on lectionary Psalms, 2014. Prayers of the People, Last Pentecost, Scroll down for Thanksgiving, Lowell Grisham, St. Paul's Episcopal Church, Fayetteville, Arkansas, 2014. Prayers for Christ the King Sunday, Michael Anthony Howard, The Pacific Pilgrim, 2014. HermanoLeón Clipart, Christ the King, Free clipart, backgrounds, slides, etc. Clip Art Images: Matthew 25:31-46, Misioneros Del Sagrado Corazón en el Perú. Ordinary 34 at Cerezo Barredo's weekly gospel illustration. Follows Latin American Roman Catholic gospel reading, though most gospels texts/themes are found in the index. Liberation emphasis. "Tiara," John Stevens, Dollar Store Children's Sermons, Video, 2014. A Song of the Shepherd King, Ezekiel 34, David JM Coleman, you tube. “Whatever You Do,” an original hymn by Carolyn Winfrey Gillette. This hymn is inspired by Matthew 25:31-46 and is in the United Methodists’ Worship and Song (2011). Tune: ST. DENIO 11.11.11.11 (“Immortal, Invisible, God Only Wise”). Abraham Journeyed to a New Country, Carolyn Winfrey Gillette, BUNESSAN 5.5.5.4 D (Morning Has Broken), A hymn for the church's ministry with immigrants. "Christ the King," "King's Song," Brenton Prigge, NewHymn. Hymns of the Spirit Three, Christ the King A, Richard E. Hurst, Universalist National Memorial Church. Psalm 100 set to Laudes Domini (666.666), Psalm 95:1-7a set to He Leadeth Me (88 88 D), by Dale A. Schoening, Metrical Psalms. Hymn and Song Suggestions, Reign of Christ, 2017, annotated suggestions from Natalie Sims, Singing from the Lectionary. Lectionary Hymns, Reign of Christ, UMCDiscipleship.org. Sing for Joy, Pentecost 28A, 2008. Choral reflections on this week's lectionary readings, St. Olaf College. 'CatholicMom.com: Coloring Page, Mass Worksheet, Crossword Puzzle, and Word Search based on weekly gospel text. Weekly Devotion Page, Faith Formation Journeys. Lectionary Puzzles, Christ the King. Word search puzzles in RTF or plain text, by Reg McMillan, St.Stephen's Presbyterian Church, Peterborough, Ontario. Worshiping with Children, Christ the King / Reign of Christ, Including children in the congregation's worship, using the Revised Common Lectionary, Carolyn C. Brown, 2014. 2011. Faith Formation Journeys, Children Sermon, 2017. Story for Children's Worship and Family Activity, Christ the King, at word-sunday.com: A Catholic Resource for the Lectionary by Larry Broding. "Unto the Least of These," and "King Backward," Charles Kirkpatrick, Sermons4kids.com.